Sid Meier’s Civilization V: Gods and Kings is the first expansion pack for Civilization V - the critically acclaimed 2010 PC Game of the Year. This robust expansion covers the entire scope of time from founding your first Pantheon of the Gods and spreading religion across the world, to deploying your spies in enemy cities in order to steal information and technology. Expanded Epic Game: The core game experience has been greatly expanded. Additionally, there are even more new units and buildings included in the four new Scenarios for modders to use. 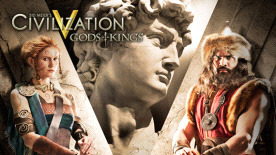 New Civilizations: The expansion will deliver 9 new civilizations, such as Carthage, the Dutch, the Celts, and the Maya (it is 2012, after all), along with their unique traits, units and buildings. The expansion also includes 9 new leaders including William I, Prince of Orange, Boudicca and Pacal the Great. Enhanced Diplomacy and Espionage: Establish embassies at foreign courts for closer ties (or clandestine operations). As the religions of the world start settling in, and the world moves into the Renaissance, you unlock your first spy (with more to come). City-States: Two new city-state types have been added (Mercantile and Religious) to bring all new advantages to the table. The city-state quest system has received a complete overhaul to decrease the importance of gold and add a whole range of new quests that further the narrative of the game. It is possible for Mac and PC to become out of sync during updates. Within this short time period, Mac users will only be able to play other Mac users. This game is not supported on volumes formatted as Mac OS Extended (Case Sensitive). The following video chipsets are not supported for Civilization V: ATI Radeon X1000 series, HD 2400 Nvidia GeForce 7000 series, 8600, 9400 Intel GMA (950/X3100), HD 3000. © 1991-2012 Take-Two Interactive Software and its subsidiaries. Developed by Firaxis Games. Sid Meier’s Civilization V: Gods and Kings, Sid Meier’s Civilization V, Civ, Civilization, 2K Games, Firaxis Games, Take-Two Interactive Software and their respective logos are all trademarks of Take-Two interactive Software, Inc. Fork Copyright © 2012 Fork Particle, Inc. Rapid XML Copyright © 2006-2012 Marcin Kalicinski. Lua Copyright © 1994–2012 Lua.org, PUC-Rio. Uses Granny Animation. Copyright © 1999-2012 by RAD Game Tools, Inc. Uses Miles Sound System. Copyright © 1991-2012 by RAD Game Tools, Inc. All other marks and trademarks are the property of their respective owners. All rights reserved. The content of this videogame is fictional and is not intended to represent or depict an actual record of the events, persons or entities in the game’s historical setting.